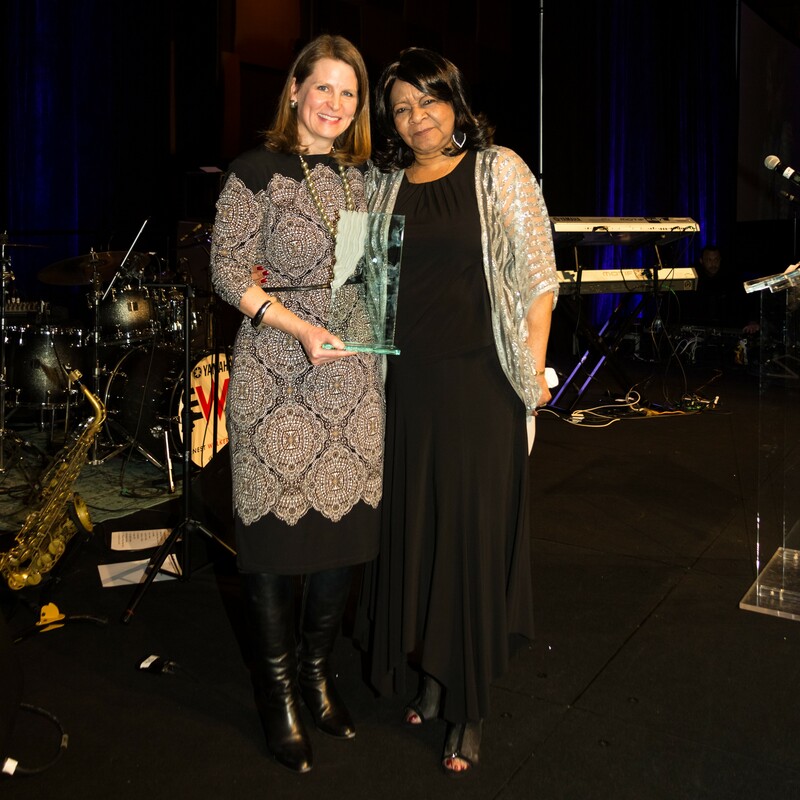 01/31/2018 - AFSCME is having a National Moment of Silence to remember brothers Cole and Walker on February 1, at 1pm EST, and asked APWU members to join with their union sisters and brothers. Indeed, all workers deserve to be safe at work. The struggle for justice and dignity continues. 01/29/2018 - The table below indicates the date and corresponding pay period in which locals and state organizations can expect headquarters to deposit the Dues Check Off (DCO) rebate monies via Electronic Fund Transfer (EFT). 01/26/2018 - President Mark Dimondstein has a message for the APWU members eligible for the Voluntary Early Retirement (VER) announced by the USPS earlier this month. 01/26/2018 - A recording of the livestream of the APWU Contract Tele-Town Hall on Jan. 24 is now available at this link (your members-only login will be required). 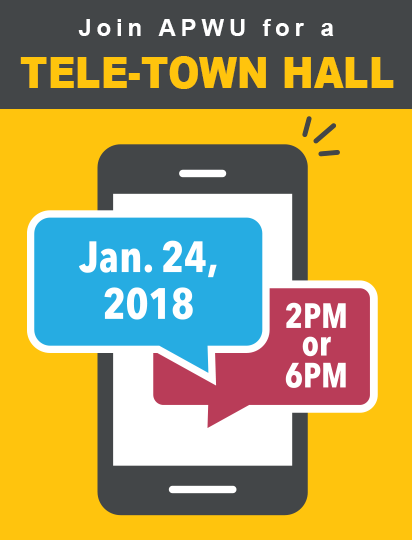 Join APWU for a 2018 Contract Negotiations Tele-Town Hall on January 24! Note: This event has passed. A recording of the livestream of the Tele-Town Hall is now available at this link (your members-only login will be required). Read more about Join APWU for a 2018 Contract Negotiations Tele-Town Hall on January 24! 01/23/2018 - The Voluntary Early Retirement (VER) recently announced for eligible Clerk Craft employees by the USPS has generated many questions. Members are asking, “Should I accept early-out retirement?” It is not the place of the National APWU to give advice on whether to retire or not. That is a personal decision. However, it is a decision with implications that members should consider. The Voluntary Early Retirement (VER) recently announced for eligible Clerk Craft employees by the USPS has generated many questions. 01/16/2018 - The Clerk Craft and the USPS agreed on a $36 million remedy settlement for the Postal Service’s violations regarding the Sales Retention Team (SRT) Pilot Program. The money will be distributed among Clerk Craft employees to be identified by the National APWU. 01/11/2018 - The Voluntary Early Retirement (VER) recently announced for eligible Clerk Craft employees by the Postal Service has generated many questions from the members of the APWU... It is not the place of the national APWU to give advice on whether to retire or not. That is a personal decision. However, it is decision with implications that members should know and consider. 01/09/2018 - On Jan. 5, the APWU and USPS signed a Memorandum of Understanding Re: Clerk Craft PSE Hiring and One Day Break. The new MOU designates Saturday, the first day of the pay period, as the hire date of all Clerk Craft Postal Support Employees (PSEs).